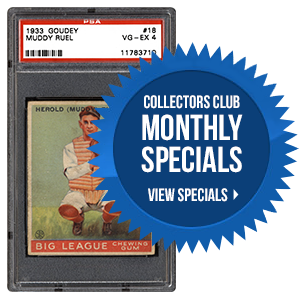 People often talk about the rich history of baseball, but football has quite a rich history of its own. 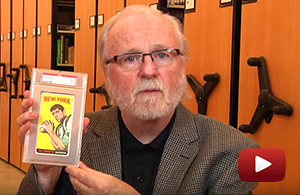 What better way to view that history than through the trading cards that chronicle the game for over 100 years? The incredible Hunt/Casterline collection, currently on display at the Pro Football Hall of Fame in Canton, Ohio, does just that. In the following feature, we learn more about this remarkable amassment of gridiron cardboard. 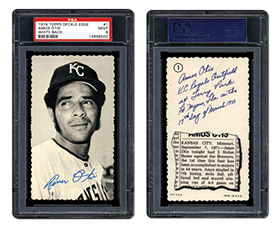 The 1974 Topps Deckle Edge baseball card set is one where nearly a third of the cards in the set feature a Hall of Famer. Years ago, this unique set seemed to get more attention from the collecting community, but it hasn’t been in the limelight in recent times. Is it due for a comeback? We dig into this 72-card issue in the next article. There are cards and there are cars, and then there are cards about cars. 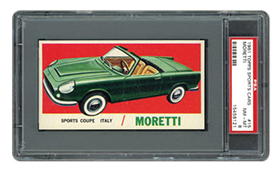 In 1961, Topps issued a 66-card set that featured nothing but sports cars from all over the world. This colorful set captures so many of the classics that, today, break the bank at auction. If you can’t afford an all-original, vintage Porsche or Jaguar, you can still appreciate their beauty in this interesting set. 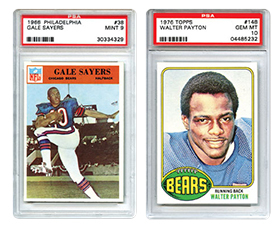 Which of the following is your "Super Bowl" of football cards? The Set Request web page has been updated with newly requested set composites. With the summer months behind us, we will continue to focus on new set requests and player set additions. You can expect to see many new set composites added over the next couple of months as we whittle down the very long list of pending sets. As always, your patience and continued support is greatly appreciated. Should you have any questions, please feel free to contact us at [email protected].